Whether it’s additional space, adding another bath or bedroom or finishing your home’s lower level, choose Titus Contracting. We will provide you with the design ideas, quality materials and the best craftsmanship to make your dreams into reality. We also pride ourselves on our great customer service and communication. Let’s get started today! A room addition is great for providing additional living space for a growing family or changing lifestyles, or just maybe to increase the current square footage. If you have a restrictive lot size, it might be best to expand the top rather than the sides, and add on a second story to your home.Additions add a different dimension to your home. 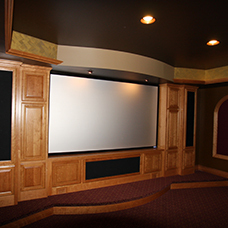 Whether it’s adding to your family room or enlarging the master bedroom, the Titus Contracting team has the expertise to increase more than just your space: we’ll add to its allure and class. No matter what you want from your addition, our staff can help. Click here for our Additions Gallery. Click here to see our Basements Gallery. The most popular home remodeling projects are in the kitchen and bathroom. Homeowners prefer these areas to be the most functional and efficient, and look amazing at the same time. 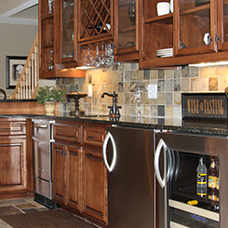 A remodeled kitchen will provide you with the highest return on investment of any home remodel you undertake. This room is the one that will get you the most for your money, and will be a big selling point if you ever decide to put your home on the market. Click here to see our Kitchen Remodeling gallery. Why should you have your bathroom remodeled? 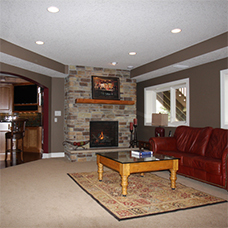 Not only will you add a fresh new look but your home’s resale value will increase. Click here to see our Bathroom Remodeling gallery. Questions? Give us a call at (952) 444-2301 or Click Here to Contact Us.